Nicki Minaj is selling beef-adjacent merchandise, including a queasy pink backpack toting the words “Nicki Stopped My Bag,” debuted via her Instagram. 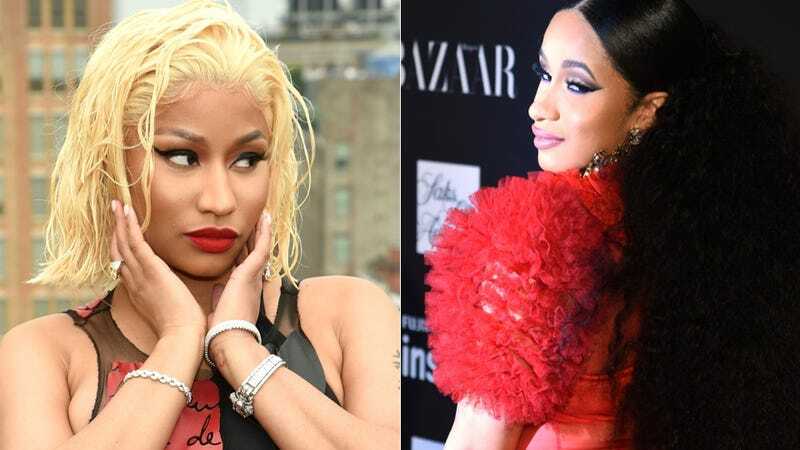 It was only a month ago that the tiff between Cardi B and Nicki Minaj reached a heady apex, which included a bit of physical violence, at a Harper’s Bazaar party. Cardi threw a shoe at Nicki, and incurred a nasty bump on her head, allegedly via the jostling of event security. Nicki discussed the matter on her outrageous apple music podcast, Queen Radio, and also at some point likened herself to Harriet Tubman. It’s financial intimidation of the ugliest sort, so I think Nicki’s merch is bad in more ways than one. After the melee, Minaj insisted that Cardi’s behavior was embarrassing; not because she enraged another grown woman to the point that she literally removed an expensive platform heel and chucked it at her, but because the almost-brawl occurred at such a highfalutin event. The best thing to come of all of this was Azealia Banks’s Instagram video, linked here. Marion “Suge” Knight, 53, was sentenced to 28 years in state prison for charges of murder and attempted murder stemming from a 2015 altercation that left a man dead. Knight pleaded no contest to voluntary manslaughter of Terry Carter, a music industry executive. Surveillance footage captured Knight’s car running into another man, who was injured, and over Carter, who died later of his injuries. The children and family of Richards were among those Knight glared down inside the courtroom. Knight’s long period of decline has often been taken as some sort of karmic retribution for a host of sins, including his fabled involvement with Tupac’s death. I love urban conspiracy theories like I love A Star Is Born; they literally fascinate me to no end. I don’t think that Knight was involved in Shakur’s murder, but what I find interesting is that his public persona is so menacing that people find it absolutely conceivable. I’m reading a fictionalized recount of Andrew Cunanan’s murder of Gianni Versace by Gary Indiana, and he mentions the role that public/media narratives shaped the manner in which everyone remembered Cunanan. My point is that there are people about whom you hear something terrible and have no trouble believing it. Suge Knight is one such person. Sidenote: remember in Michel’le’s biopic, when she recounted the myriad abuses she’d suffered under Dr. Dre, and claimed that Knight was a perfect gentleman, and had in fact saved her? Reader, I was gobsmacked. Knight will likely be released within 10 years due to prison overcrowding.